I have a case Aurora R4 with a Motherboard Andromeda X51 installed. Everything works fine. but for a reason idk. it wont change the color of the lights even though they work. Any ideas ? Yes I tried the command center from DEll's website and also AlienFX on the app store commend ceter on windows 10. None seem to help yet. In a youtube video a guy installed an Asus mobo on the R4 and the lights could change on that. so what am I doing wrong ? please help ? Thanks for replying. Yes the lights are definitely on and stay on. they don't ever change color. I just updated my x51 core components in windows 7 64 bit. I downgraded from windows 10 to see if it helps. just to try it. nothing seems to change it right now. if this helps. I can tell you that the alien head led is white constantly and the side panels are lit up green constantly also on the R4 case. im using CC 3. in the command center it shows the x51 case because of the motherboard being an x51. and not the aurora case its installed. into. and I think because the led on the font alien face is white must mean its in some kind of maintenance mode or something. idk. so according to the tester the case is not being detected by command center and the motherboard is not reading correctly or being recognized in full. so that makes sense if the white led does in fact mean there is a maintenance mode that is functioning on the I/O board. also the white led on the front doesn't change color for booting. I read somewhere that its supposed to go red for a instant during post. but it starts white and stays white all the time while its on. on boot. the white led comes on first then the side panels which are green. ok. that's makes sense. but where do I get the R4 for data key from ? I cannot access my origin board or is there somewhere I can download one ? so if I get this correct you need to backup your origin BIOS first. then import the alienware BIOS needed install CC. then before you reboot. 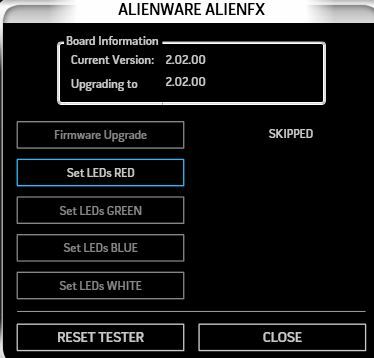 you replace the alienware BIOS with the origin BIOS then reboot. I don't know if I should use the BIOS in the thread or hunt down an R4 BIOS key.